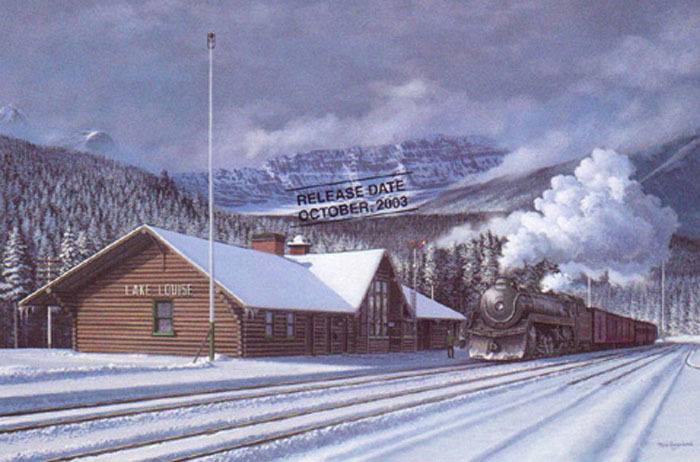 Image Size: 9" x 6" Framed Size: 14" x 11" Originally known as Laggan, this station was renamed Lake Louise in 1914. The handsome log building replaced a smaller one in 1910 and though no longer serving as a railway station, it lives on as a fine restaurant. An eastbound train of tuscan-red cars slows to pick up train orders attached to a hooped stick held up by the station operator and hooked aboard the train by the arm of one of the engine crew as the big locomotive rolls by.